Even though pregnancy and labor are the most natural phenomena, some pregnancies however turn into high risk situations. There could be many factors and various situations in pregnancy that can pose high risk to the health of the mother and the baby. At ‘The Gynae Clinic,’ we ensure that you and your unborn baby are provided with the best and comprehensive care throughout pregnancy for safest maternal and fetal outcomes. A regular antenatal care, constant vigil over development of any untoward complications, availability of best in class investigations backups, and best labor and neonatal facilities ensures that even high risk pregnancies result in finest outcomes. Our clinic is highly recommended for high risk pregnancy care in Gurgaon by various mothers who are now blessed with healthy babies. With multiple pregnancy, the risk of maternal and fetal complications are increased manifold. During multiple pregnancy, the women can face the problem of miscarriage, preterm labor, bleeding in pregnancy and fetal loss. However, these cases can be managed very well through proper guidance and care from an expert gynaecologist. 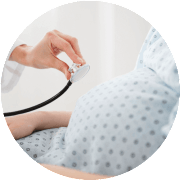 Dr Anjali Kumar has many years of experience in providing adept solutions in these cases for the utmost safety of the mother and her babies throughout the pregnancy. We deeply understand our patients emotions regarding their previous pregnancy failures (miscarriages). Dr Anjali Kumar with her skilled team of gynaecologists offers special care, counselling, investigations, medical plan, support and guidance to these patients to achieve best pregnancy outcomes. Ectopic means outside the uterus. It the one of the most worrisome and grave complications in pregnancy when the fertilized egg implants outside the uterus, most common site being the fallopian tube. The other sites of ectopic pregnancy could be ovary, cervix, abdominal cavity, etc. The mother invariably ends up losing the pregnancy and in many cases may require an emergency surgery for the removal of ruptured fallopian tube. The early antenatal care, early ultrasounds to detect the ectopic pregnancy can avert this complication. 4. Medical complications in pregnancy like- hypertension, diabetes, Rh-isoimmunisation, acquired thrombophilia. 5. Intrauterine growth retardation, oligoamnios, polyhydramnios. Dr Anjali Kumar has a vast experience in handling all types of complicated pregnancies. She heads the high risk pregnancy unit and a boutique birthing centre at Artemis Health Institute with standardised international protocols and sophisticated maternal and fetal monitoring systems. Her guidance and care has helped many women with high risk pregnancies achieve their dream of motherhood. You can contact our clinic’s front desk to know more about high risk pregnancy care in Gurgaon.